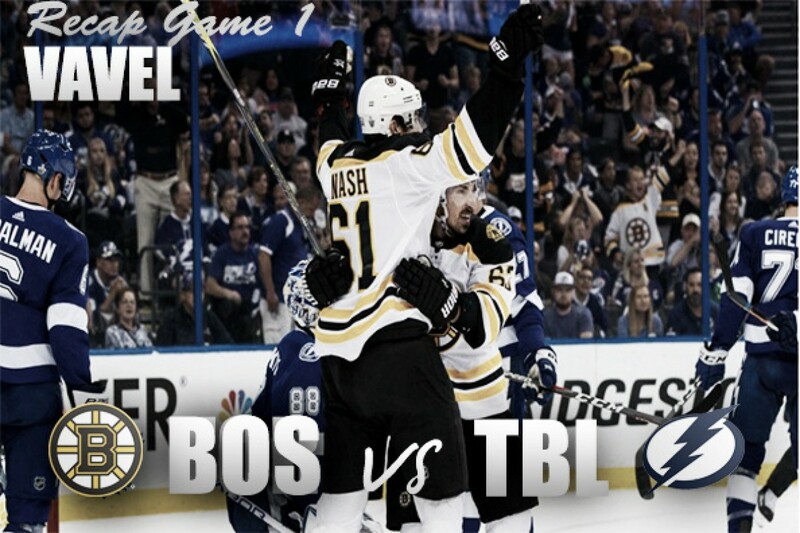 The Boston Bruins took it to the Tampa Bay Lightning in Game 1 winning 6-2. As many of us expected, the Boston Bruins would face off against the Tampa Bay Lightning in the second round of the Stanley Cup playoffs. But what we didn't know is how well they would do in Game 1. The Bruins took it to the Atlantic Division winners by a score of 6-2. Rick Nash scored two goals, and the high scoring line combination of Patrice Bergeron, David Pastrnak, and Brad Marchand combined for a total of 11 points. If you can't stop this line, you're in trouble. Bergeron also scored twice and assisted one of Nash's goals for Boston, who finished just one point behind the Lightning for the Atlantic Division title, and first place. Marchand had a goal and three assists, while Pastrnak recorded four assists. A second goal by Marchand was eventually waved off due to a cross-checking penalty by Pastrnak. In only eight playoff games, Pastrnak leads the team with five goals and 12 assists.
" I think he is just playing what is in front of him and when it is time to shoot he'll shoot. He is exploring all his options and I think he's stronger on the puck now because he has it longer. Now he has the confidence to hang on and absorb these hits or partial hits and make plays," head coach Bruce Cassidy said. "You need your best players to be your best players, and clearly that happened for us tonight. It was good for us and our guys finished, but we know over seven games you are not going to have the edge you want." Charlie McAvoy notched two assists, the second of which was a shot from the right point and was redirected by Marchand to give the visiting team a 4-2 lead 3:32 into the third period. Marchand then set up Bergeron for his second goal of the game. The Bruins only had 10 shots against Tampa netminder Andrei Vasilevskiy over the last two periods. But they made the most of those limited opportunities. Dan Girardi scored for the Lightning, who trailed by only one goal when entering the third period. Defenseman Mikhail Sergachev scored on the power play at 13:22 of the second period. Netminder Tuukka Rask tried to plead to the officials after throwing his skate blade to let everyone know he was having trouble, but Sergachev capitalized. The NHL Public Relations official Twitter had this to say about the incident: "At 13:22 of the second period in the Bruins/Lightning game, Boston goaltender Tuukka Rask's left skate blade fell out prior to Mikhail Sergachev's goal. There is no rule for referees to stop play for a broken piece of equipment, regardless of whether the equipment belongs to a goaltender or skater. The lone exception is when referees may stop play after a goaltender has lost his helmet (as outlined in Rule 9.6). When coming into the game, the B's top line was the main concern of head coach Jon Cooper. His attempt to counter with Tyler Johnson, Ondrej Palat, and Brayden Point fell through the roof in the final two periods. In order to attempt a comeback, Cooper pulled Vasilevskiy with more than six minutes left in the game. That would send up a Jake DeBrusk empty-net goal to seal the victory for the Bruins. "We lost 6-2, so it doesn't matter how we feel about how we played. We're going to wake up in the morning, somebody is going to look at the score and say 'Tampa is down 1-0' Is there stuff we can build on off this game? No question. But they got six, and in the end, we have to raise the level of our game to get back in this series," said Cooper. Game 2 is Monday night at Amalie Arena. Do you think that the Boston Bruins win in such a lop-sided game will have an affect on the Tampa Bay Lightning's performance in Game 2? Let us know in the comments section below.